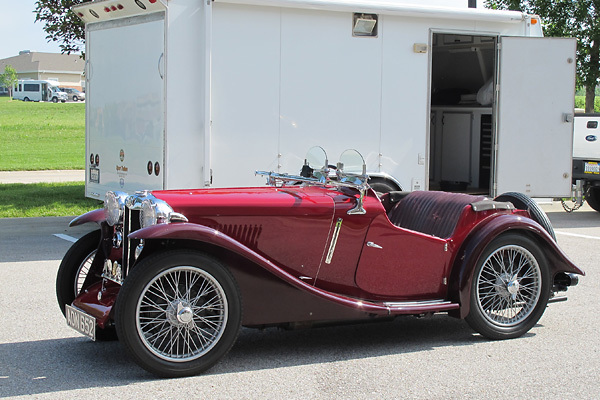 The MG Car Company functioned almost independently through the early 1930s. 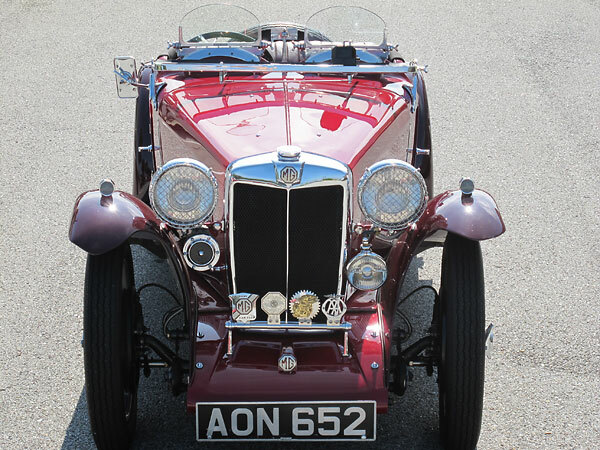 In those years, MG was at the forefront of sportscar design. The company simultaneously offered cars for road use and cars purpose-built exclusively for racing. They made frequent and significant model changes. In retrospect it seems they were managed with little concern for their financial bottom line, somehow managing thin profits despite a worldwide economic depression. The "helmet and goggles" image MG cultivated produced a loyal and enthusiastic customer base. To enthusiasts around the world, the initials M.G. seemed to be an abbreviation for "sports car". 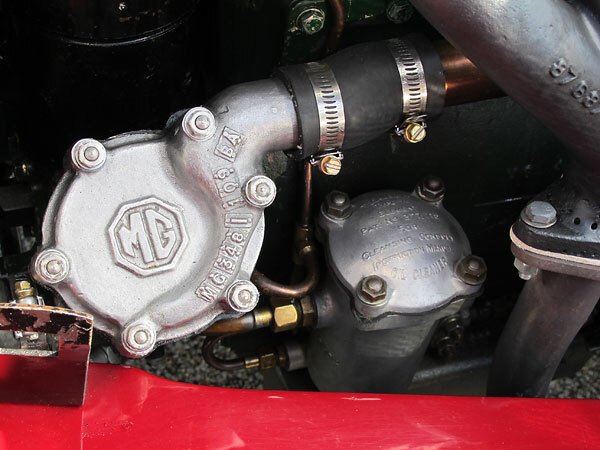 The MG PA model is considered by many to be the quintessential pre-war Midget.¹ When introduced in early 1934, its most important new feature was a three-main-bearing crankshaft. 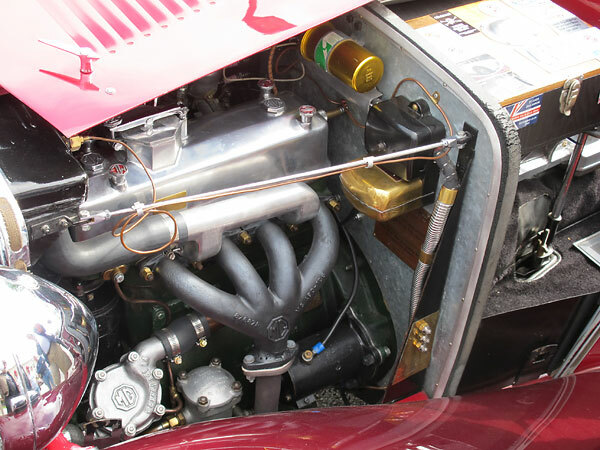 Compared to the previous (two-main-bearing) MG 4-cylinder engines, the new engines were much more robust and also much smoother running. There were other changes too: longer wheelbase, enlarged cockpit, greatly enlarged brake drums. Styling was refined too. 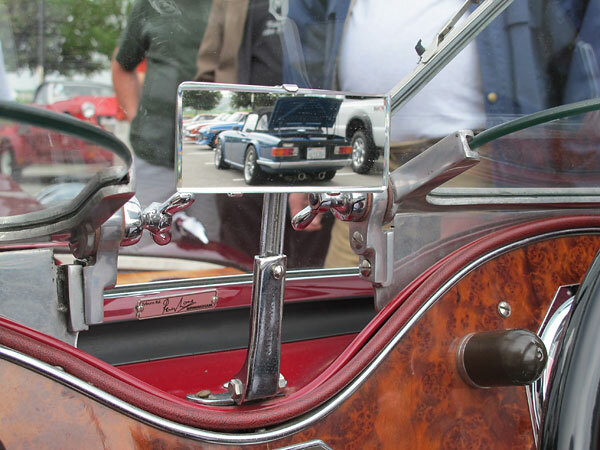 Many enthusiasts consider the MG P-type the purest expression of classic MG styling. The PA proved itself competitive in amateur racing, trials, and hillclimbs. A few P-types competed in high profile events. Most famously, "George Eyston's Dancing Daughters" were a six-woman racing team who drove three P-types in the 1935 24 Hours of Le Mans.² They raised quite a sensation, though they only finished 24th, 25th, and 26th place overall. Approaching Le Mans as an endurance trial rather than a race, the team's goal was to achieve absolutely consistent lap times - fast, but not so fast that they might break. 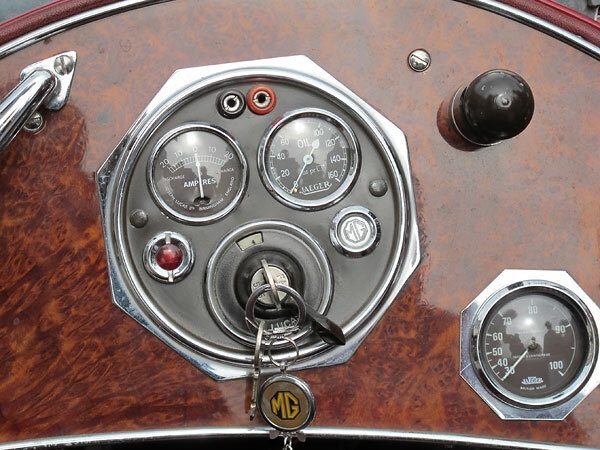 The MG team achieved an average speed of over 53mph. The three car effort only required exactly one replacement part: a tail lamp bulb! The MG PA model was produced from (about) March 1934 until late summer of 1935. 1973 cars of this type were built. No more than 150 MG PA sports cars remain in existence. 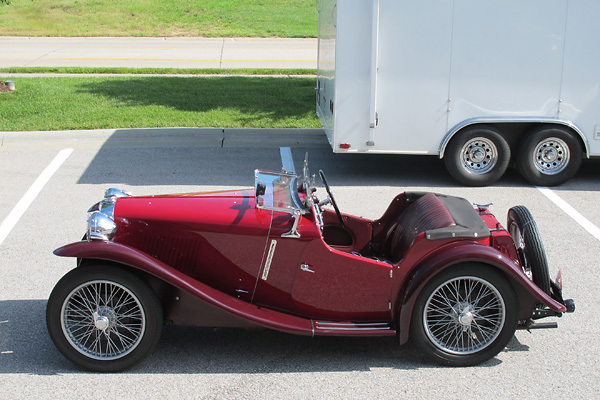 MG's PA was the last Midget sports car model produced before a major management change. 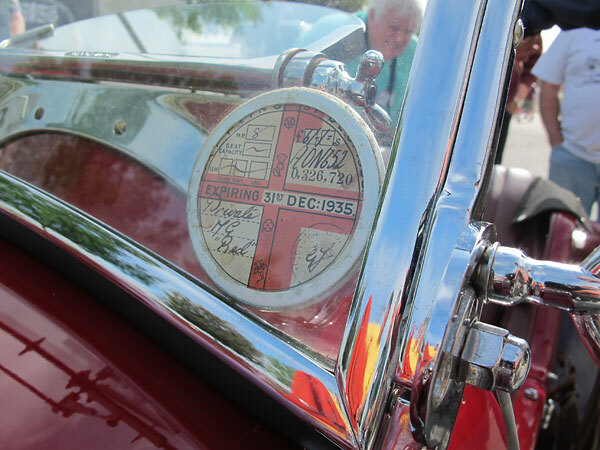 Through 1934, the MG Car Company Ltd. and Morris Motors Ltd. were technically separate companies although both were founded by, named for, and owned by William Richard Morris. In 1934, Morris became a member of England's House of Lords. Morris was thus given the honorary title Lord Nuffield. For whatever reason, in 1935 Lord Nuffield decided to sell his MG car company to his Morris (conglomerate) car company. Simultaneous to the change of ownership, it was announced that MG would no longer produce racing cars. MG's spectacular R-type racecar was abandoned before it could fully prove itself as a world beater. Morris management ordered the dispersement of MG's engineering department. Two key staff members were kept at the Abingdon factory as liaison engineers, but MG's most senior designers were moved to other divisions or let go. These management changes blindsided MG. Coincidentally, they occured at almost exactly the same time as the PA (known at the time as simply the "P" or "P-type") was scheduled to be replaced. In September 1935, MG phased-in production of the PB. The PB featured an uprated engine, a close-ratio gearbox, a vertically slatted front grille, and a different dashboard. Twenty-seven cars were updated from PA to PB specification. 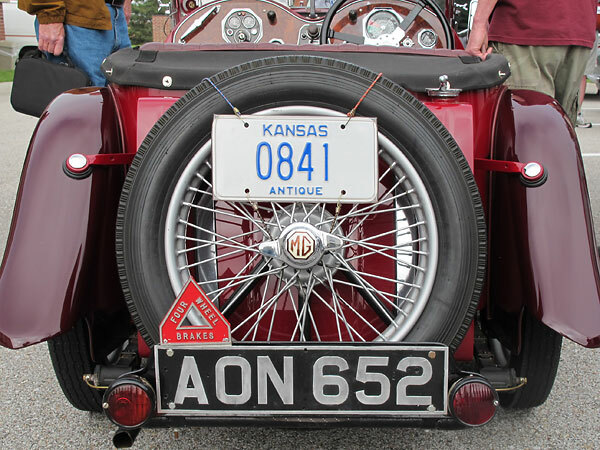 MG PB production continued through May 1936. Approximately 500 PB sports cars were built. 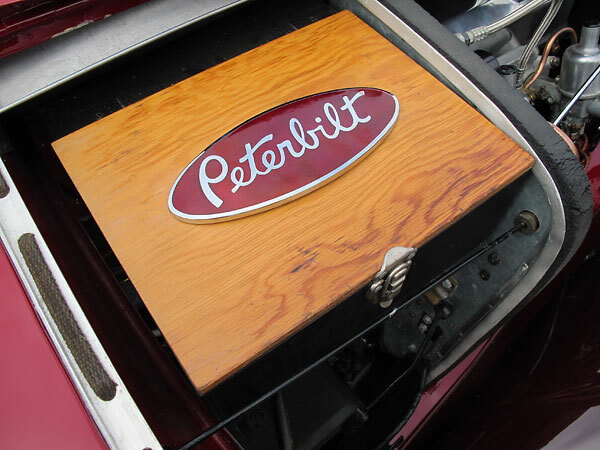 Both PA and PB were offered in either two-seat "roadster" or four-seat "tourer" trim. 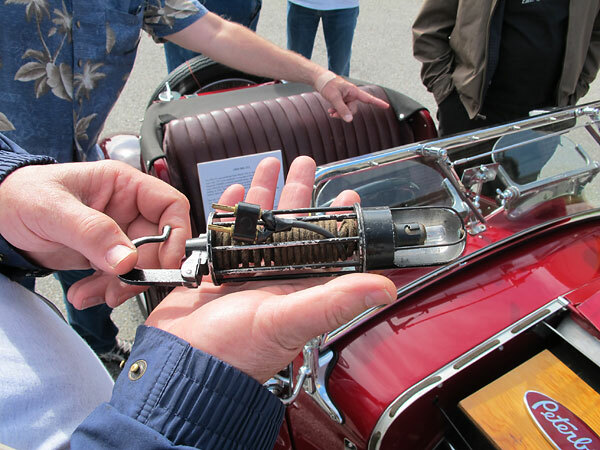 Customers were also offered a smart "Airline Coupe" body treatment, with coachwork from "Carbodies of Coventry". Less than fifty Airline Coupes were built. 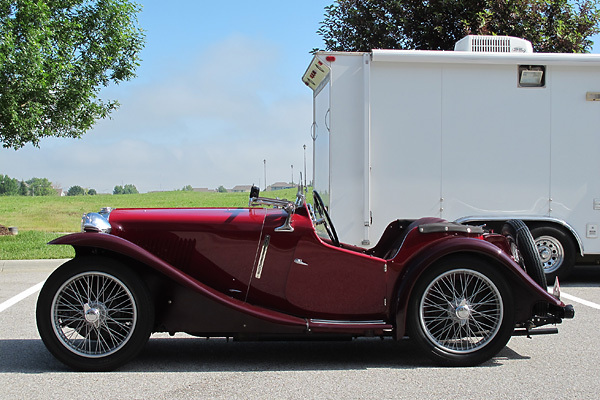 In the balance of this article we'll closely examine one particular 1935 MG PA roadster. BritishV8 usually focuses on engine swaps and other major modifications to later model British sportscars, so one might wonder why we're featuring this car. It's special, and so is its owner. 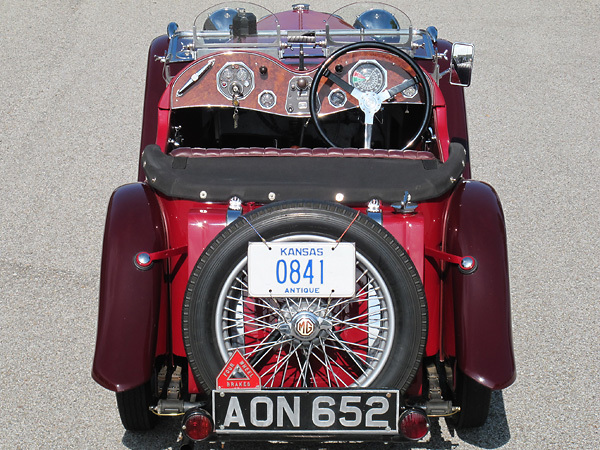 Don Bonar painstakingly and authentically restored this MG PA from basket-case to the pristine state you'll see here. Then he brought it to our British V8 2013 annual meet. He even let some of us drive it! Don is currently building an MGB V6. We'll feature that project in a future article. Engine: stock engine, rebuilt to original specifications (847cc displacement. 57mm bore by 83mm stroke. 6.2:1 static compression ratio. 36bhp at 5,600rpm rated output. 3 main bearing crankshaft. Single overhead camshaft, driven through verticle dynamo.) External oil filter. Twin S.U. 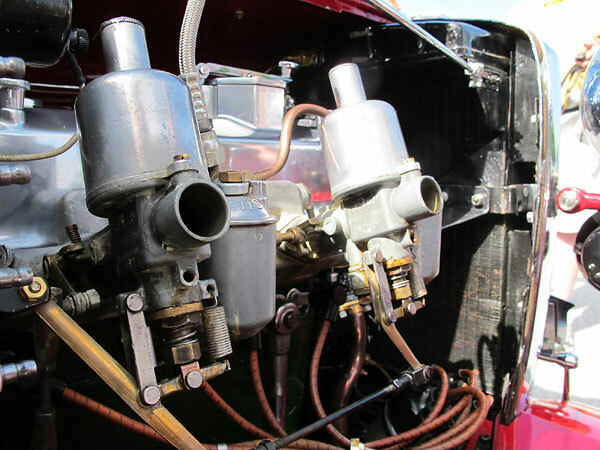 HV2 (1" bore) carburetors. S.U. electric fuel pump. Lucas Sport ignition coil. Lodge Type HN spark plugs. 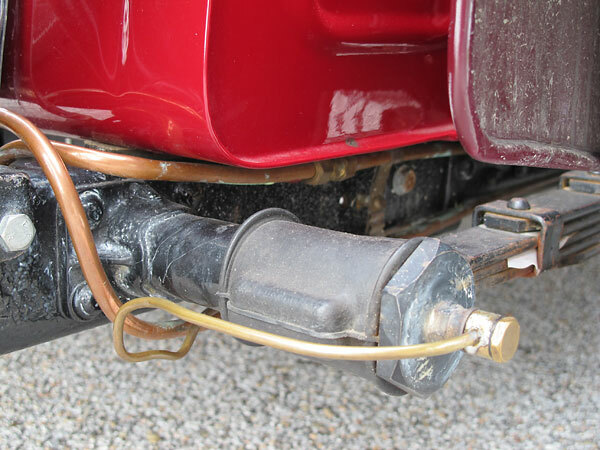 Cooling: original copper and brass radiator. 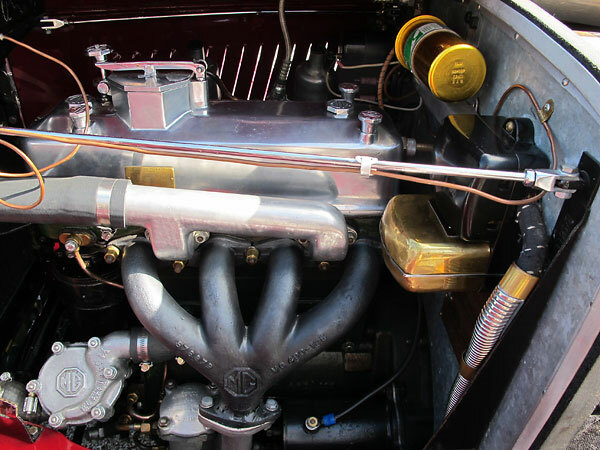 Original, optional-equipment water pump. No radiator fan. No oil cooler, although the oil pan is finned. 11.5 quart cooling system. Exhaust: original cast iron 4-into-1 exhaust manifold. Single muffler. 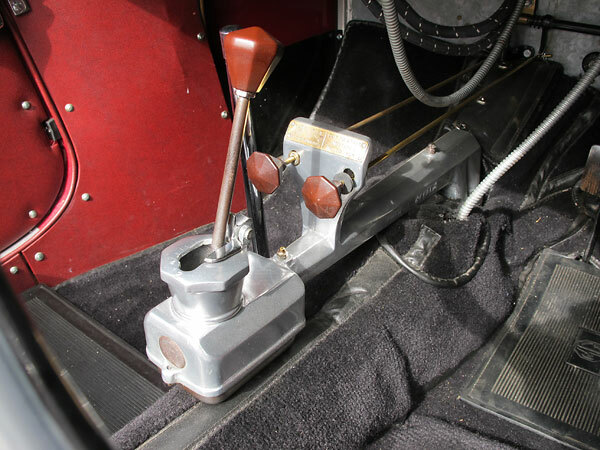 Transmission: 4-speed non-synchromesh manual. Dry clutch. Front Susp. 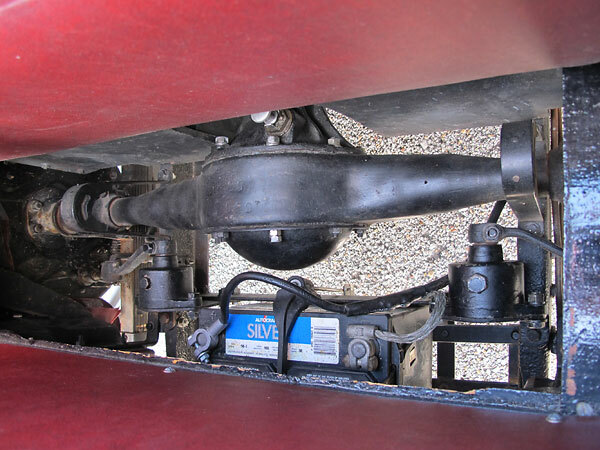 : beam axle on leaf springs. Andre Hartford friction disk shock absorbers. Rear Susp. 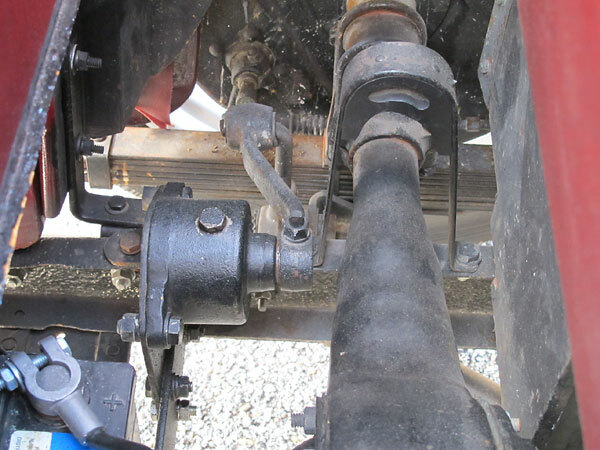 : live axle on leaf springs. Luvax hydraulic lever shock absorbers. 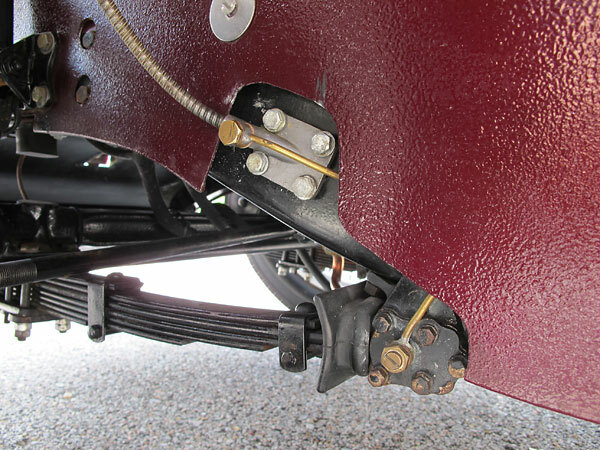 Brakes: (master) mechanically operated via cables and linkage. 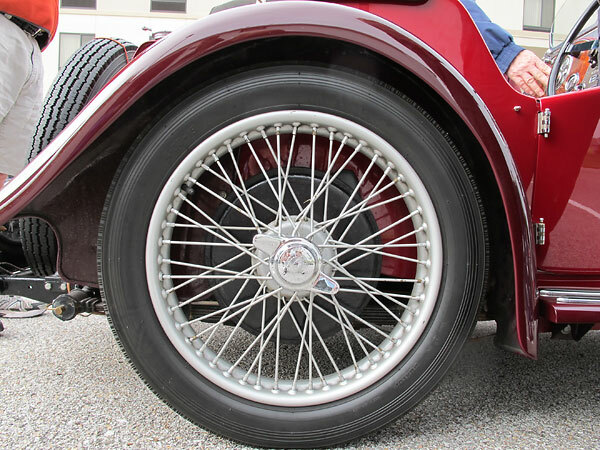 Wheels/Tires: Rudge Whitworth 48-spoke steel wheels. Dunlop tires (4.00"x19"). 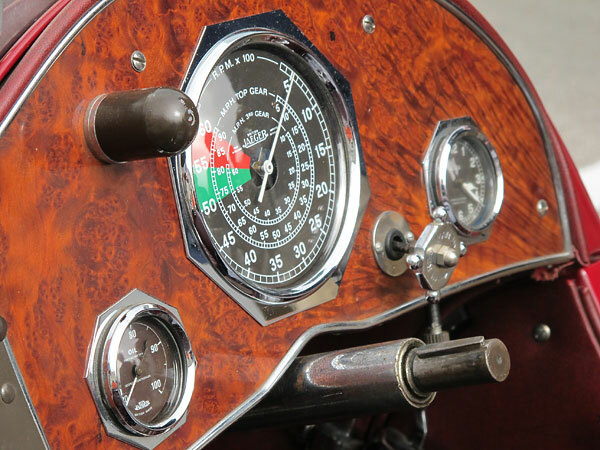 Instruments: (right to left) original optional-equipment Jaeger "8 day" clock, Jaeger mechanical tachometer (0-6000rpm with road speed ranges indicated too), Jaeger oil temperature gauge (30-100C). Jaeger water temperature gauges (30-100C), Jaeger oil pressure gauge (0-160psi), and Joseph Lucas Ltd. ampere gauge (-20 to 20 amps). 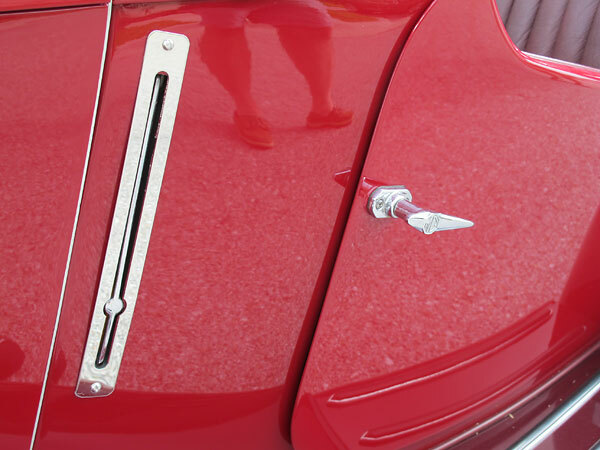 Paint: original duo-tone paint scheme in Carmine Red and Saratoga Red, restored with PPG basecoat/clearcoat. Credits: Don says: "There is absolutely NO way I could have done it alone." Approximately thirty MMM³ guys from all around the world offered parts, advice and support for the restoration. Peter Down of Reading England came to Kansas for five days to help Don sort things out and get started on the right foot. 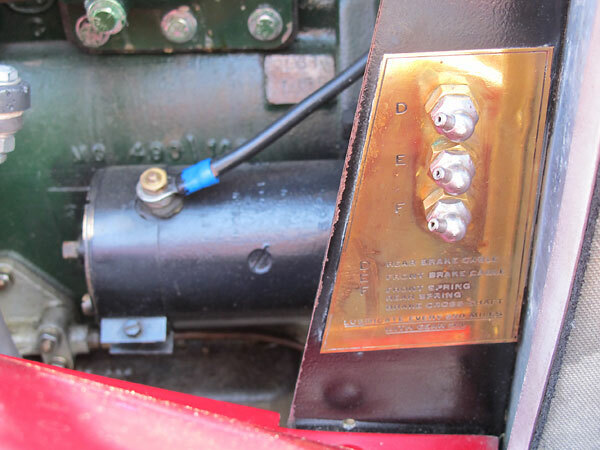 Using the Internet, Don tracked down restoration parts from eleven different countries. 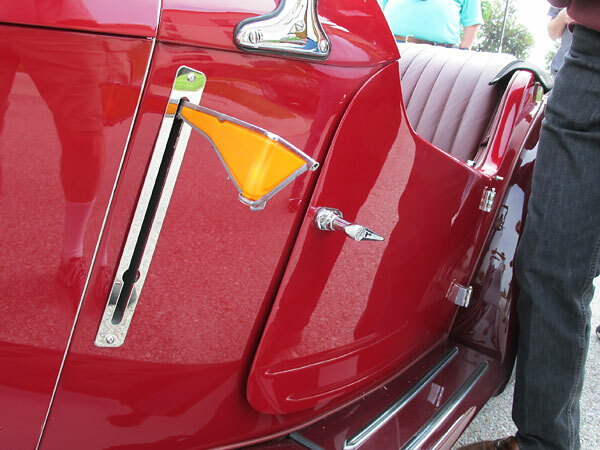 Tom Metcalf of Safety Fast Restoration provided crucial help with reproducing the original paint scheme accurately. 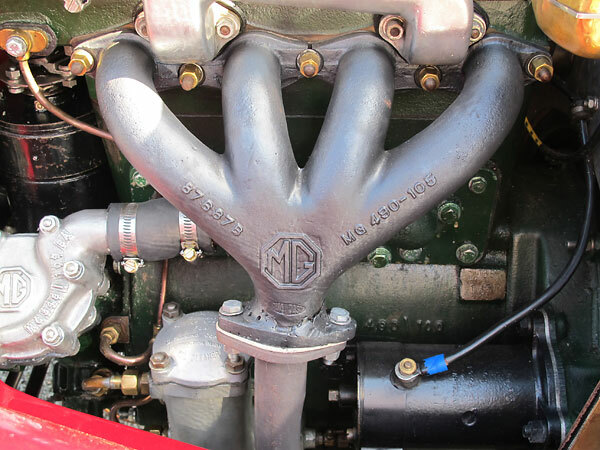 Bill Davidson has been a tremendous help and has shared Don's "enjoyment" of discovering the mysteries MG's pre-war overhead cam engine. and they responded well to tuning. Superchargers provided a popular upgrade path. 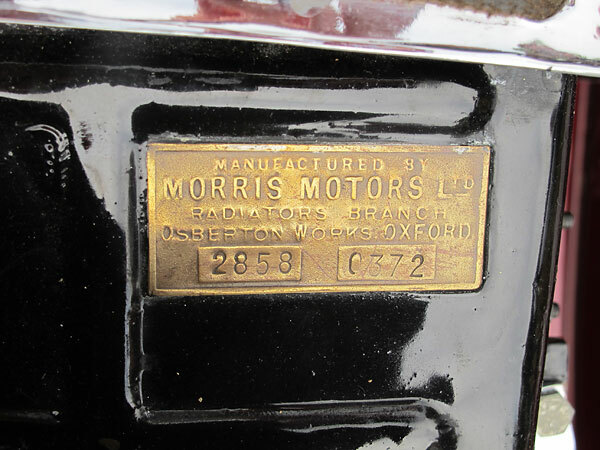 "Manufactured by Morris Motors Ltd., Radiators Branch. Osberton Works, Oxford." 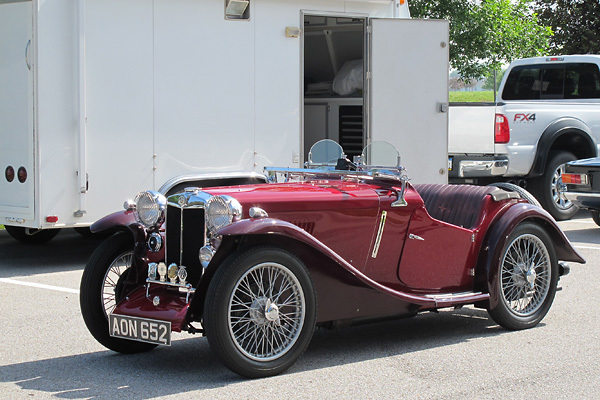 first appeared on MG T-series sportscars. Twin S.U. 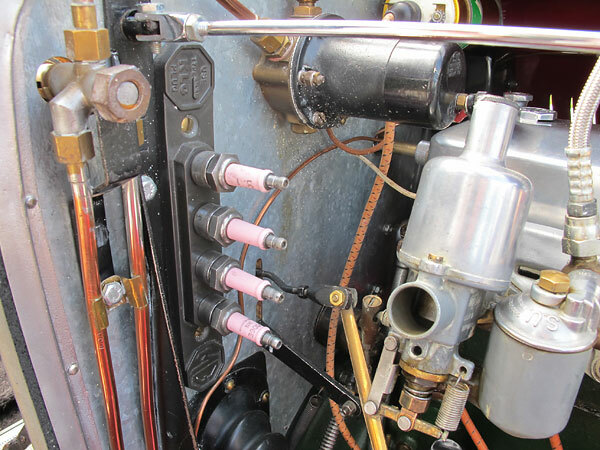 HV2 (1" bore) carburetors operated via mechanical linkage, not a Bowden cable. Intake air filters weren't provided from the factory, until T-series production. 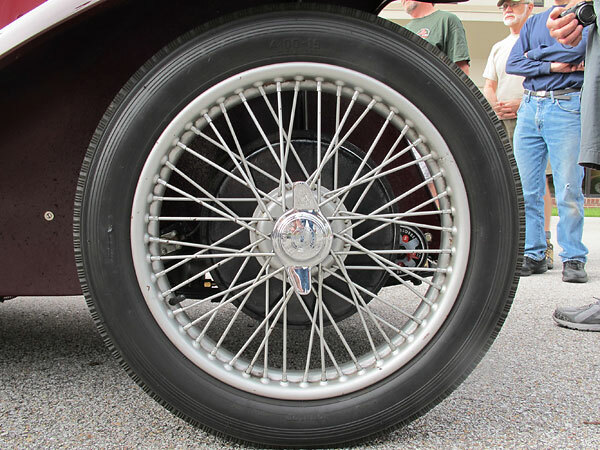 ring design was found to add almost four horsepower, bringing the total to 43.3hp at 5,500rpm. bears the trademarks of both MG and also KLG (i.e. another spark plug manufacturer). 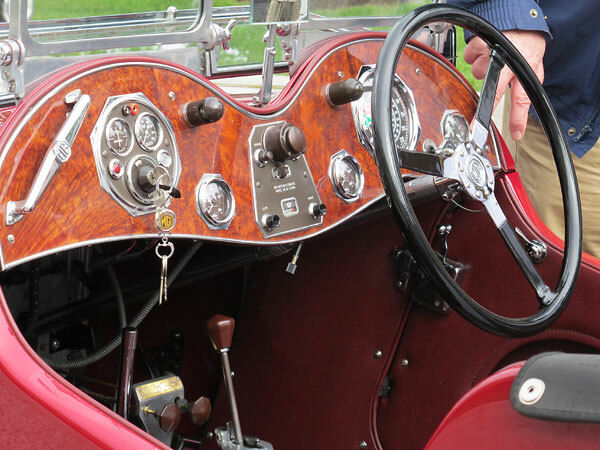 is operated by a dashboard mounted knob. Dipstick. The sump holds one Imperial gallon of oil and it's finned on the bottom. 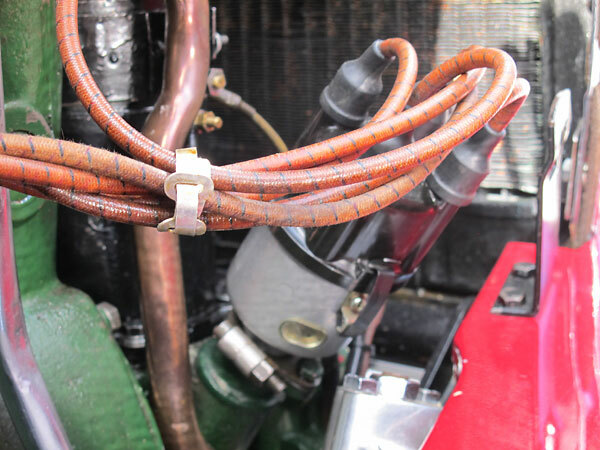 Centralized (right hand side) lubrication system ports simplified routine maintenance. 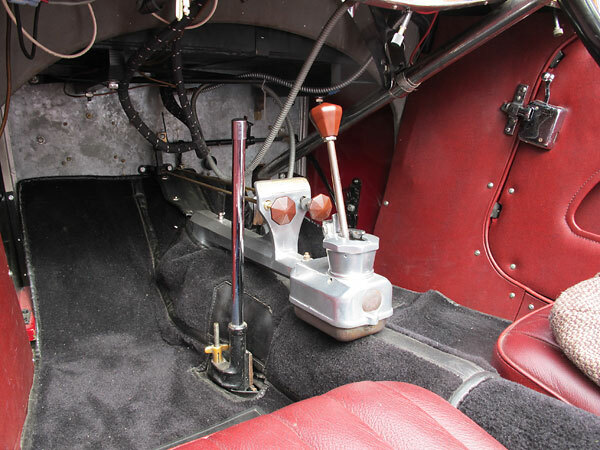 steering column, brake cross shaft. Lubricate every 500 miles with gear oil." 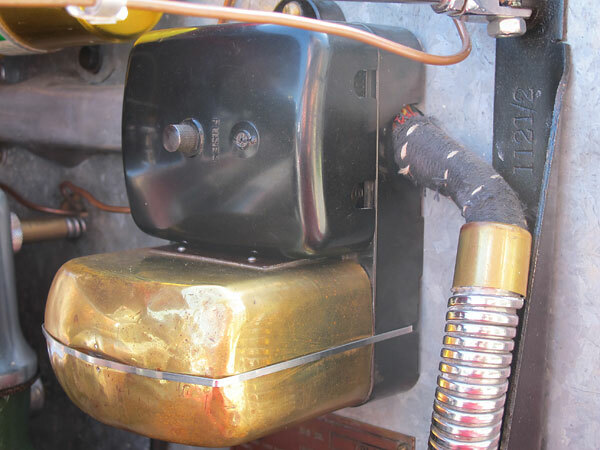 Fuse box (with Bakelite cover) and cut-off switch (with brass cover) are located together. device, so savvy owners turn on their headlights to prevent overcharging their batteries. It seems pretty much everything that could be octaganal in shape, was. is marked "2068A 165P". 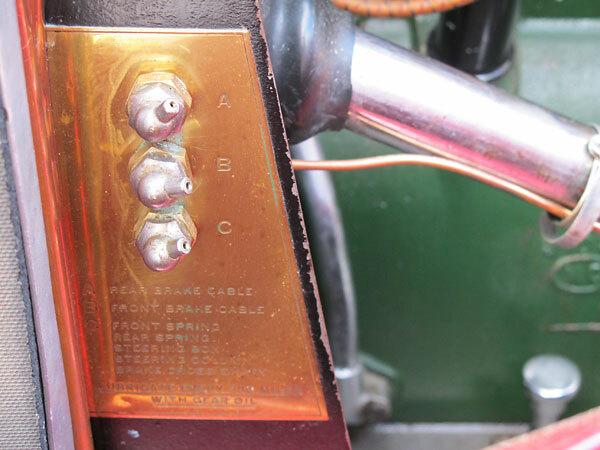 Lower right: Lucas electric starter. 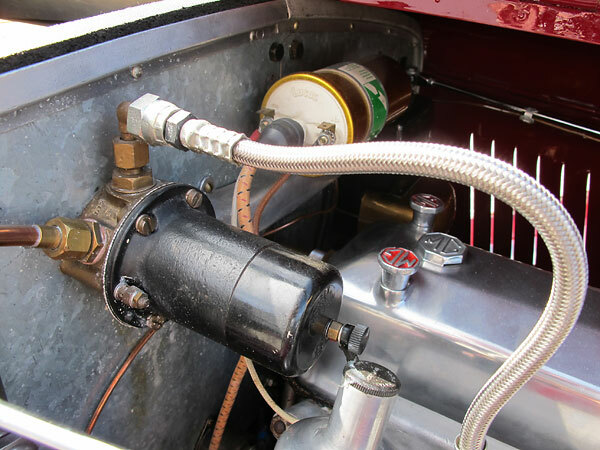 centralized lubrication ports were an important convenience feature. brake cross shaft. Lubricate every 500 miles with gear oil." water would still naturally flows through the cooling system due to convection. To its right: engine oil filter. in April 1935). For IFS, frames needed to be re-designed to maximize stiffness. 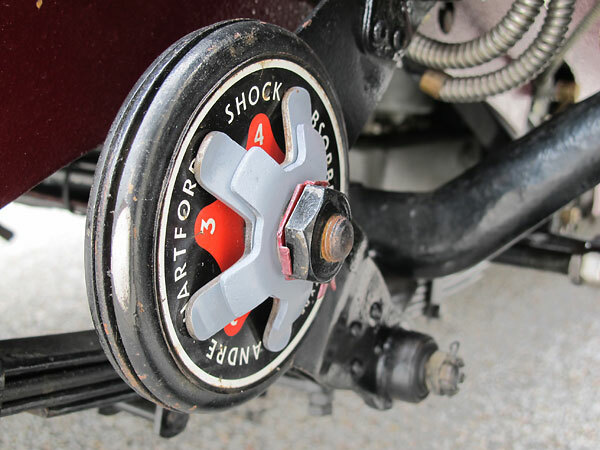 Andre Hartford Ltd (of Shrewsbury in Shropshire) adjustable friction disk shock absorber. 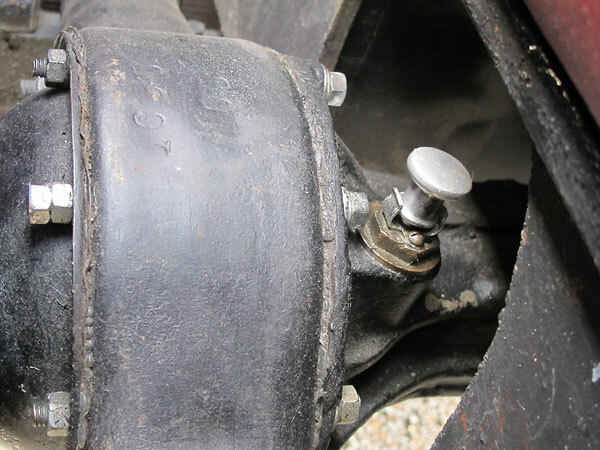 Brake cables and leafspring mounts are both lubricated periodically with gear oil. 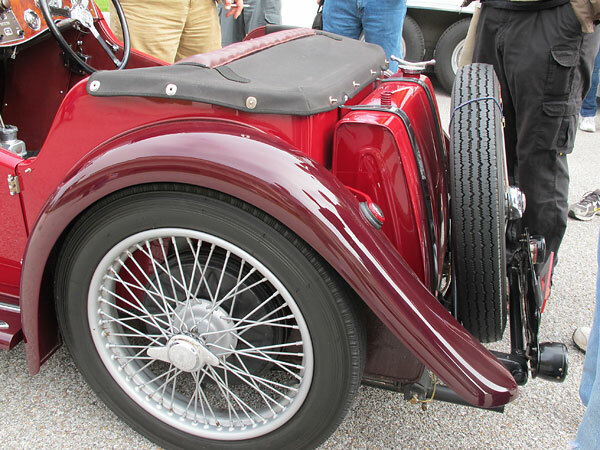 Compared to the J-type which preceded it, the P-type had a slightly longer wheelbase (86"
it was about 225 pounds heavier. Track width was unchanged at 3' 6". 5.375:1 rear axle. 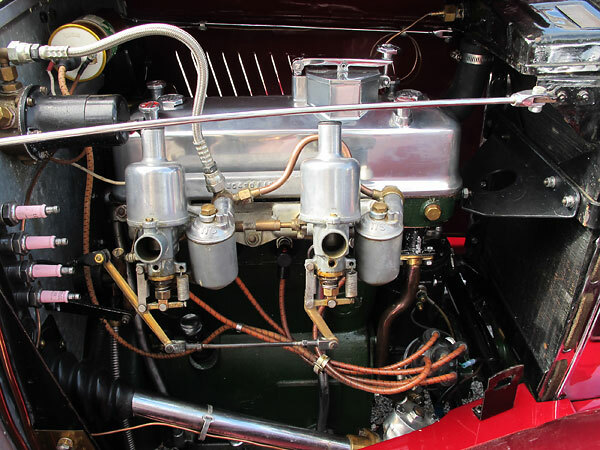 A dipstick was provided so oil level may be conveniently checked. 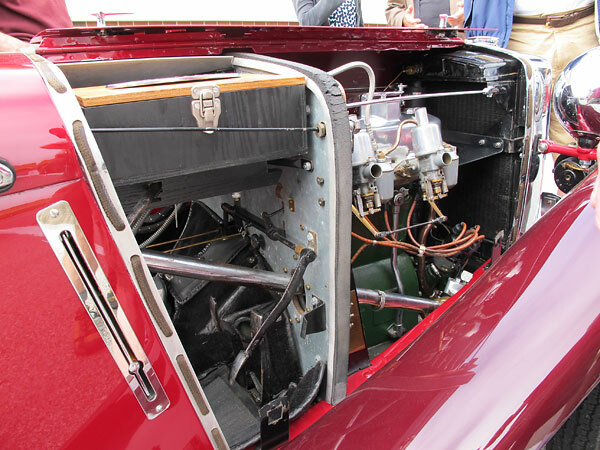 were originally fitted with dual six volt wet-cell batteries. banned export of redwood. MG switched to English Walnut for the PB model. 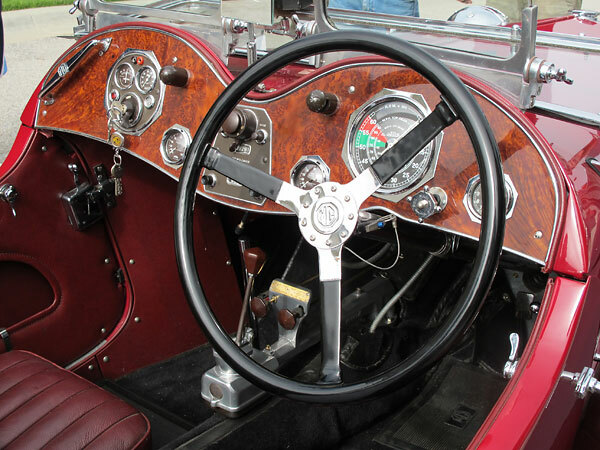 why "banjo style" aftermarket steering wheels were an extremely popular accessory. 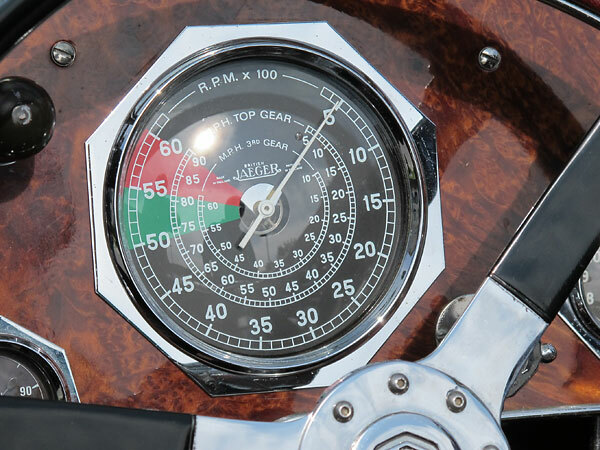 Jaeger mechanical tachometer indicates road speed too, assuming you know which gear you're in. 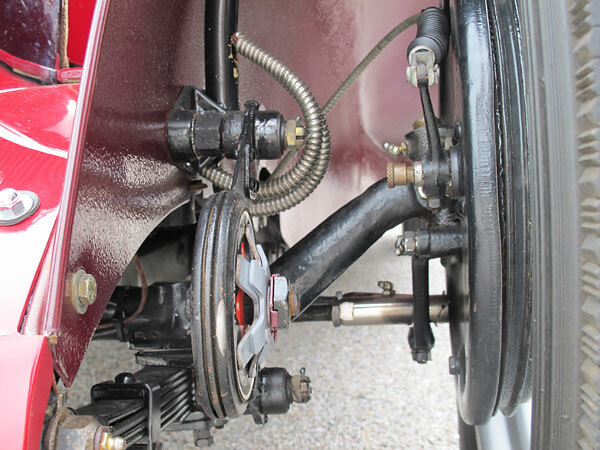 One of a handful of modest modifications: Don uses a quick-release pin on his steering wheel hub. gauge. Instead, rely on your odometer or trust the reserve supply to get you to a gas station. Left: Jaeger oil temperature gauge (30-100C). Right: Jaeger "8 day" clock. 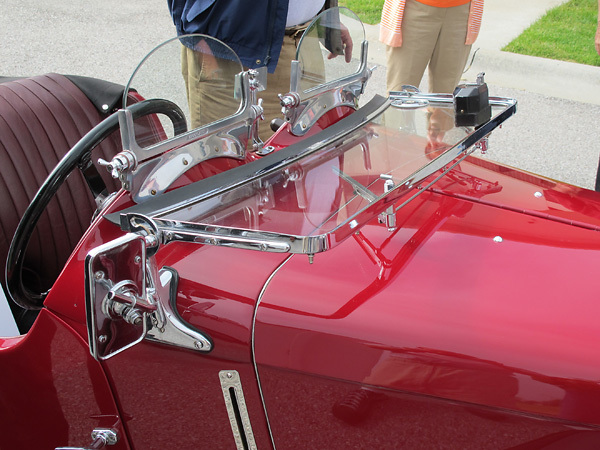 so MG provided adjustable "Divers Helmet" style lights for nighttime driving. trafficator (turn signal) pushbutton, trip odometer, right side trafficator pushbutton. pressure gauge, and an MG labeled plug. Off to the right: Jaeger water temperature gauges. provided windscreens and related vehicle components since June 22nd, 1932. 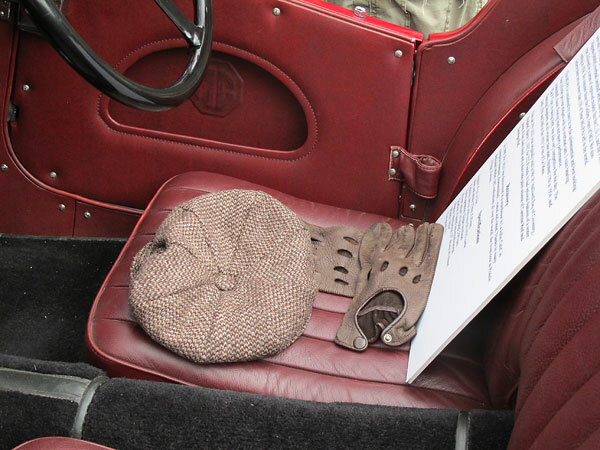 Tweed cap and leather driving gloves. 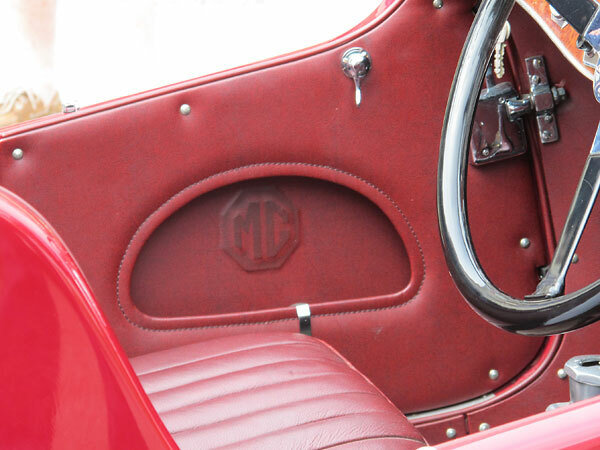 MG P-type doors have built-in glove pockets. 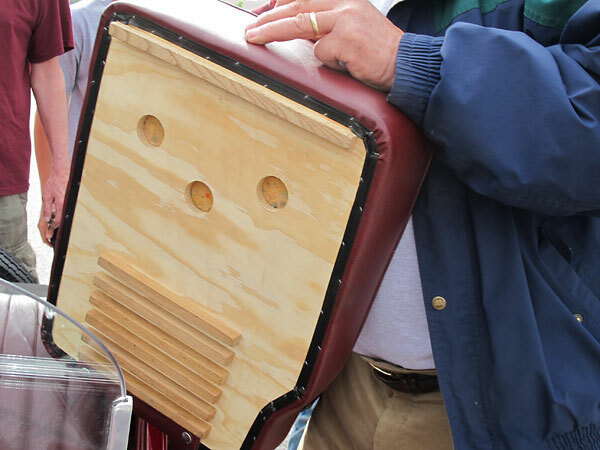 Adjustable seat: five selectable (fore and aft) seat cushion positions. 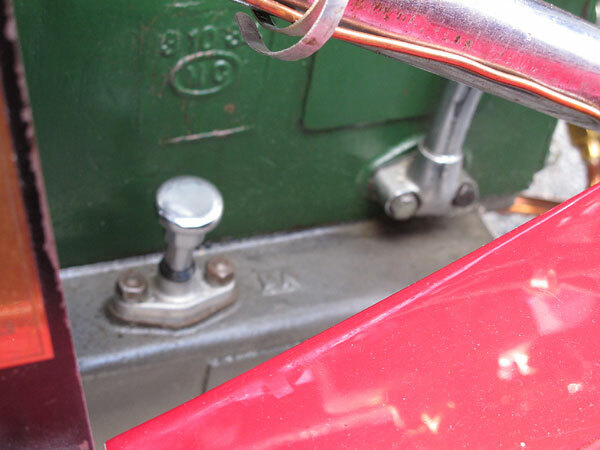 Lefthand knob controls idle speed. Righthand knob controls choke. 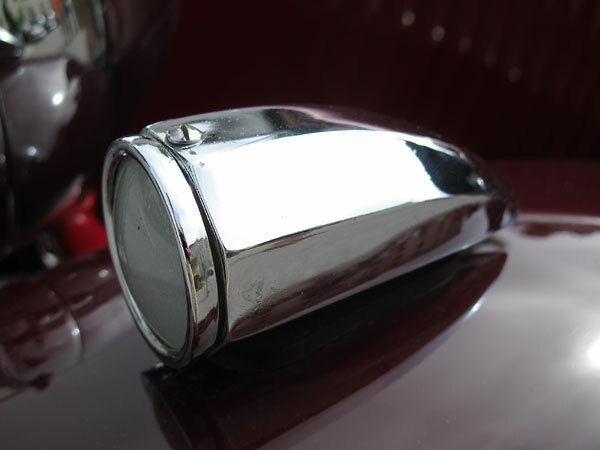 Pull the choke knob to richen the fuel mixture for cold starts. not to release the parking brake. 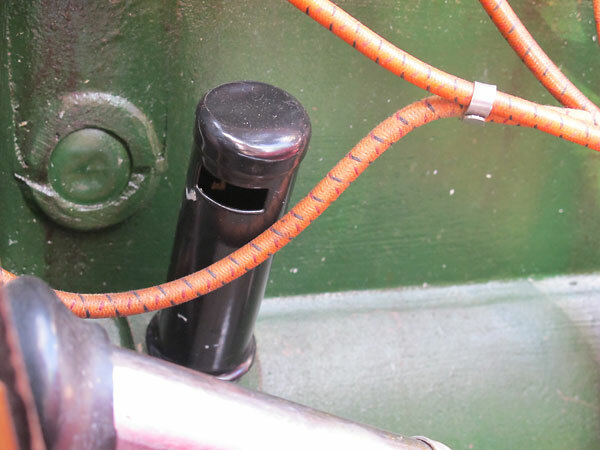 Don't think of this lever as just a parking brake! used often. 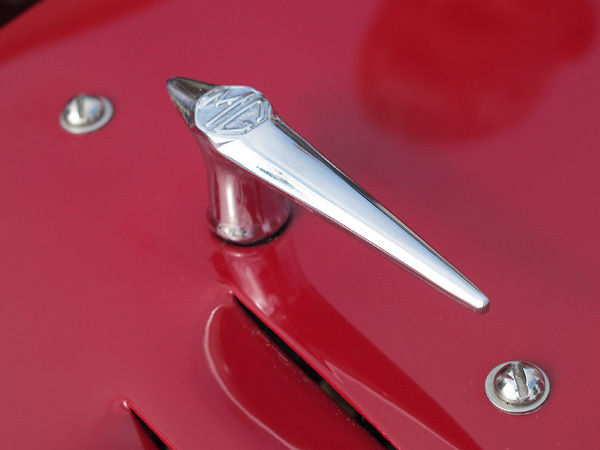 The lever bypasses some friction points and provides helpful leverage. 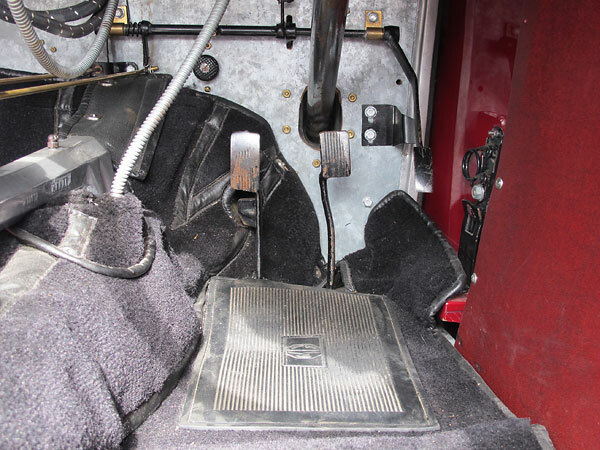 The round device above and to the left of the clutch pedal is the engine's starter switch. 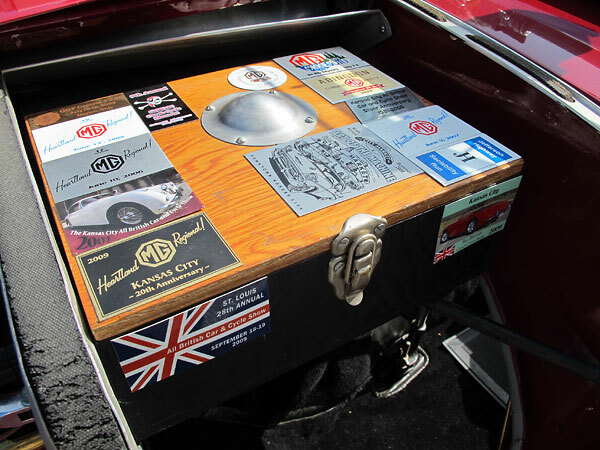 "Tools, jack, and accessories for 2-seaters were fitted on the floor behind the backrest. spot-on right down to the 3" domed metal cap on the left one to make room for the jack." Peter Down of Reading England came to Kansas to help Don get his restoration started. Later, Don honored him by installing this Peterbilt emblem. 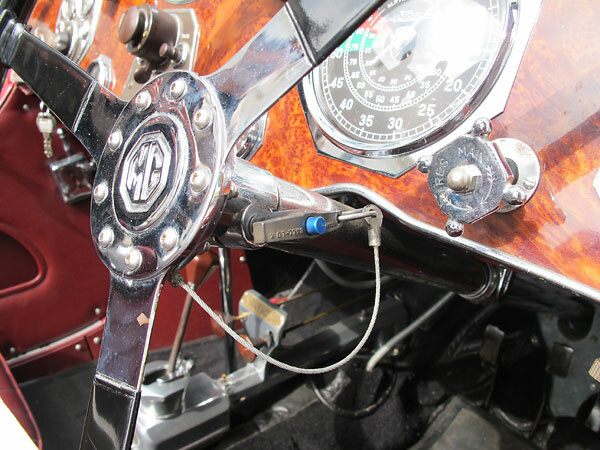 "Trouble Torch" with retractable cable and a plug sized to match a dashboard mounted receptacle. Your BritishV8 editor accepted an offer to drive this car during the BritishV8 2013 meet. it manages to feel quick and it's uncommonly agile and willing. It's 100% percent sports car. MG originally used cellulose paints. Don's paintjob features durable PPG basecoat / clearcoat. and one year earlier on Magna models. This particular PA was originally purchased by Mr. H. Halliwell of Coventry on March 1, 1935. Purchase price? £222 plus £1 60p for the optional-equipment water pump. In 1999, it was found in La Jolla, California: disassembled, rusted, and rotted. 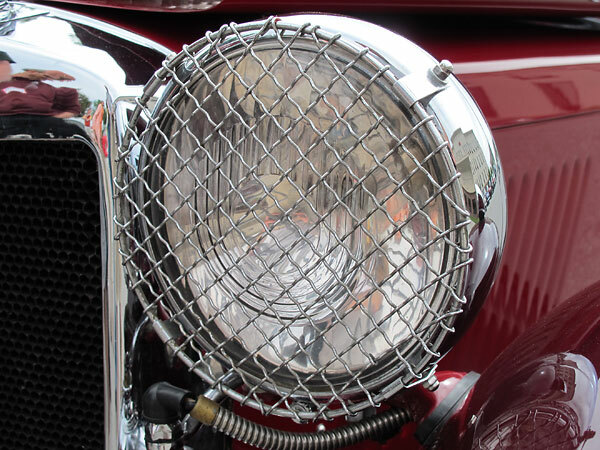 September 1935, the PB model was the first MG to feature a vertically slatted grille. Fender mounted marker lights, octagonal in cross-section. This tax disk indicates that taxes were paid-up through 31st December 1935.
standardized equation for determining horsepower considered only piston surface area. Poorly written tax code resulted in generations of small-bore, long-stroke engines. 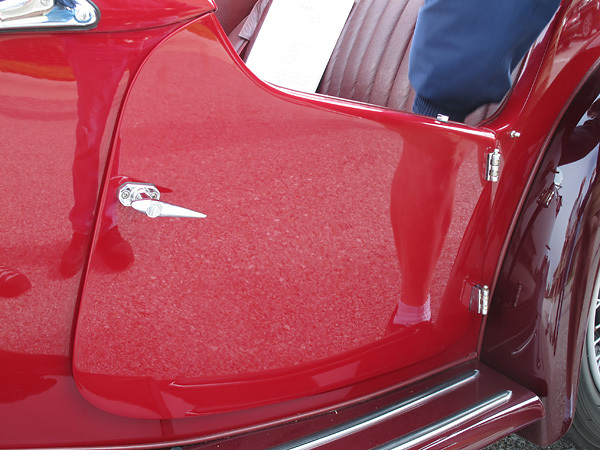 "Suicide doors" is the popular name for car doors that hinge from the rear. They make entering and exiting easier, but be sure to latch them properly! Trafficator (semaphore) turn signal - retracted. Trafficator (semaphore) turn signal - extended. decelerate more quickly than its contemporaries. speedometer mounted passenger side and tachometer mounted driver side. 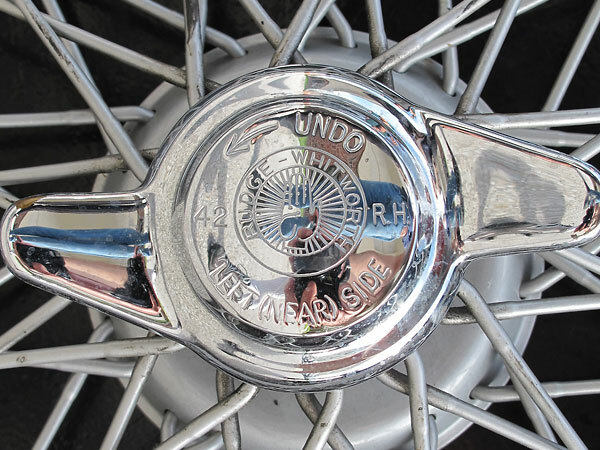 Rudge Whitworth 48-spoke steel wheels. 1911 to 1946, Rudge Whitworth also manufactured motorcycles. (1) In MG parlance, the Midget designation applied to a whole range of lightweight four cylinder sportscars produced over many years. 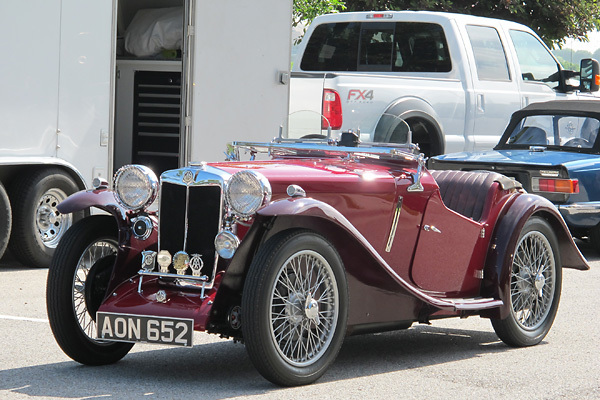 MG also produced six cylinder sports cars; that series was known as the "Magna" range. 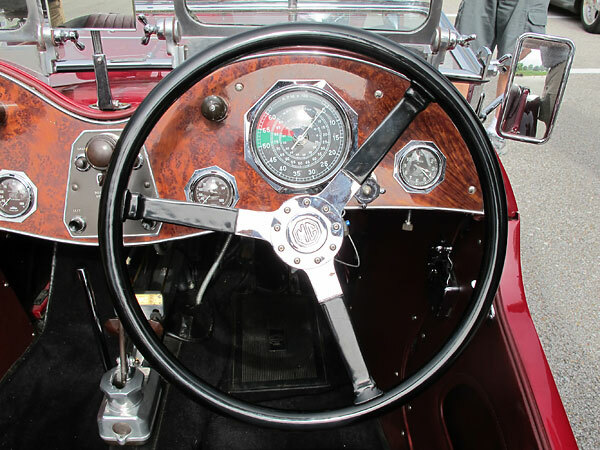 MG produced large luxury cars, which they called "Magnettes". The T-series sports cars that American GI's fell in love with during WWII were technically Midgets, whether buyers knew it or not. Midget didn't become a model name until the 1960s. 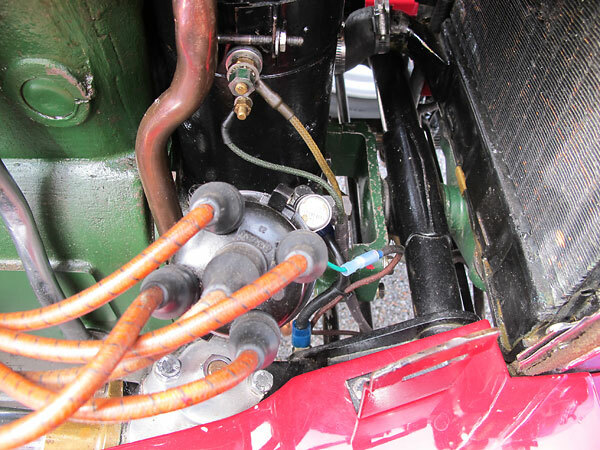 (2) The uprated engine of the MG PB came in reaction to the 1935 Le Mans race results. Singer 972cc sportscars dominated by finishing 1st, 3rd, 4th, 6th, and 7th in the under-one-liter class. (Those five cars finished 16th, 19th, 20th, 22nd, and 23rd overall.) The quickest of the Singer racecars outran the Dancing Daughters team by about ten miles per hour over the 24 hour race. 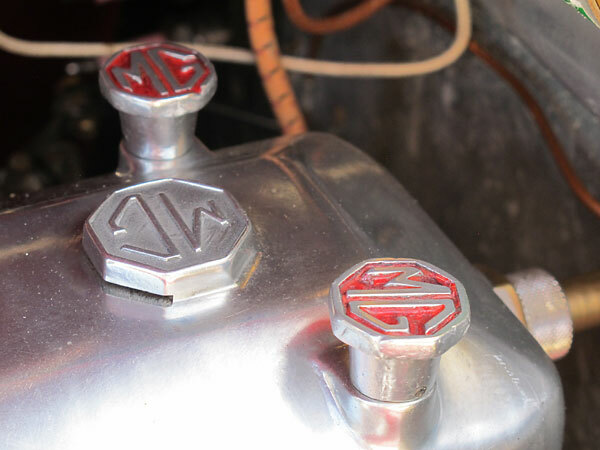 MG delivered a very significant performance enhancement by increasing displacement from 847cc to 939cc; and did so with no price increase at all. Results? The 1936 24 Hours of Le Mans race was cancelled due to a general strike in France, but in 1937 an MG PB entered by George Eyston and co-driven by Dorothy Stanley-Turner and Joan Riddell finished fourth in class and sixteenth overall. Four Singer entries failed to finish the race. 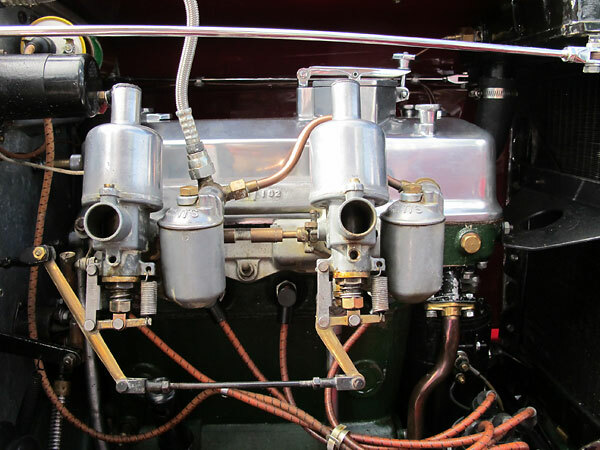 (3) The P-type is part of the Midget, Magna, and Magnette ("MMM") family of overhead camshaft engine powered cars, which started in late 1928 with the M-type Midget and continued through a progression of models (C-type Midget, D-type Midget, F-type Magna, J-type Midgets, K-type Magnettes, L-type Magna, N-type Magnettes, both PA and PB type Midgets, Q-type Midget, and R-type Midget) through 1936.